The elbow joint has one of the weakest skin coverage of all joints of the body. The muscle and skin covering the joint is thin which makes it more exposed to injuries. We can notice people who have had elbow fractures at an early age or even people with malunion of elbow fractures. In our country, these kinds of disorders were used to be badly treated by non-professionals. In fact, because of tightly wrapped bandages injuries called Volkman Contructure, which left a permanent tightness in the hand, used to occur. It should be kept in mind that the elbow joint is not a joint that can easily get dislocated. Despite its delicate and soft tissue, it has a tight single structure formed by the combination of three joints. The elbow joint consists of the ulna and radius (forearm bones) and the humerus. The lateral collateral ligament system on the outer part and the medial collateral ligament system on the inner part hold the elbow together. With the aid of both the bones and the ligaments, we can effortlessly perform both flexing and extending movements. These are the structures that limit the varus (inner) and valgus (outer) movements of the elbow. Otherwise we would not be able to lift our arms to carry anything heavy. This firm internal structure helps us when doing daily activities or playing sports. In sports like volleyball, wrestling, basketball, tennis etc., players may sometimes have elbow trauma as a result of falling down or colliding with others. Commonly the elbow is injured by falling on the palm. Our elbows have a natural 14 -15 degree exterior tilt (carrying angle). With the burden of the body weight, it turns into valgus axial pressure and external rotation force. As a result, a series of injuries can occur, from elbow dislocations to fractures with dislocations, depending on the severity of the injury. The dislocated elbow becomes swollen suddenly. It is ruptured from the exterior (LUCL) to the interior (MKL). Sometimes dislocation is also accompanied by surrounding bone fractures like radial head fracture, olecranon fracture, and coronoid fracture. If it has only been dislocated, it is important that it is relocated by a specialist while under anesthesia within six hours. Because, the ulnar nerve which gives feeling to the pinky and ring fingers travels through the interior part of the elbow. The main artery and median nerves are found on the front and the radial nerve goes through the exterior part. These structures may be affected when there is swelling or tightness. Sometimes the ulnar nerve is transferred to the front to prevent nerve compression in advance. The injury called ‘thrower’s elbow’ is rarely seen in our country. It is a serious sports injury in countries where the baseball is a popular sport. Similar injuries can take place in javelin throwers, volleyball players and also goalkeepers, where the interior ligaments of the elbow (MKL) can get sprained or ruptured. Injuries can also happen to the exterior ligaments of the elbow as a result of falling down and may affect the performance of athletes. Injured ligaments are attached to the bone by using anchors. For reconstruction, a ligament is taken from another part of the body to restore the torn ligaments. The details of the traumas that happen along with the fracture are identified by the doctors using an MR or a tomography. 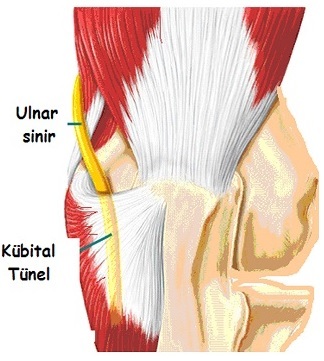 This shows small cartilage tears and other cartilage and ligament injuries in detail. Not every dislocated elbow needs to be operated on. However, it may need extensive physical therapy. At first, it might be necessary to use a hinged elbow protector. An early operation is essential when the elbow is both dislocated and fractured because the elbow joint can become stiff easily. Even after surgery, the heterotopic ossification joint contractures may develop. Specialists and physiotherapists are extremely important for recovery in such cases. The most severe elbow injuries are lateral and medial dislocations with fractures. These types have both segmented fractures and a ruptured ligament. In this case, it is important to fixate the ligament and fractures with a plate-screw system and to start movement in the early stages. The combination of radial head fracture + elbow dislocation + coronoid fracture, which is called the terrible triad, is also a surgery that should be performed extremely carefully. The radial head is a circular bone which is located in the outer side of the elbow. In segmental fractures, this part can be replaced with prosthesis. However, prosthesis surgeries for the elbow joint are not recommended for rheumatoid elbows or for patients older than the age of 65. It is the disorder also known as tennis elbow. It begins with the inflammation of the muscle fibers which are attached onto the outside of your elbow. These are the muscles that allow us to raise the wrist and fingers. Pain is felt in the area where the muscle connects onto the bone or at full length of the muscle. Usually, the pain becomes palpable after doing forceful activities with the arm. For the housewives it may start with the activities like ironing and wiping the floor. Diminishing in the grasping power of the hand and having difficulty even when lifting light objects become a problem for patients with advanced cases of the disorder. The reason it is known as "tennis elbow" is because tennis players who use the wrong technique are more prone to this disorder. When it is experienced on the inside of the elbow, it is called ‘golfer's elbow’. Regular use of the arm or an injury in the area causes pressure increase and damage where the muscle is connected to the bone. Symptoms start on the elbow. This problem is generally seen in people who use their arms and wrists actively or people who lift heavy objects with their palms facing down. This disorder is frequently encountered in people in their 30s and 40s. The area where the pain is the most intense is the bony bump on the outside (lateral side) of the elbow, which is also known as lateral epicondyle. The pain intensifies in the area when pressure is applied. The discomfort increases when gripping. In serious cases, every movement of the elbow causes pain. It is certainly necessary to limit the activities causing pain and stop lifting heavy objects with the palms facing down. The protection of the injured muscles is sometimes ensured by wrapping a bandage around the elbow during recovery. In some cases, a wrist brace (resting splint) is used for the same purpose. Anti-inflammatory drugs are administered. In long-term serious cases, painful area can be given injections; yet generally this provides only a temporary solution. Stretching exercises that your hand therapist or physiotherapists have recommended will help muscles get stronger. Some patients are in need of physical therapy. As the healing process continues, the patient can slowly go back to normal daily activities. If the patient does not respond to medication or physical therapy, then surgery is recommended. 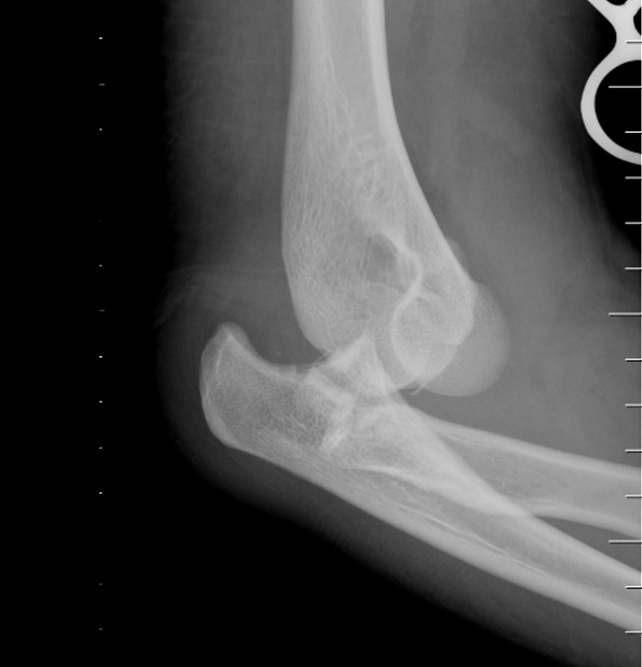 How does elbow dislocation occur? The most important symptoms are pain and a visible elbow deformity. The patients cannot move their elbows. The diagnosis is finalized with a physical examination and x-rays taken by the orthopedist. 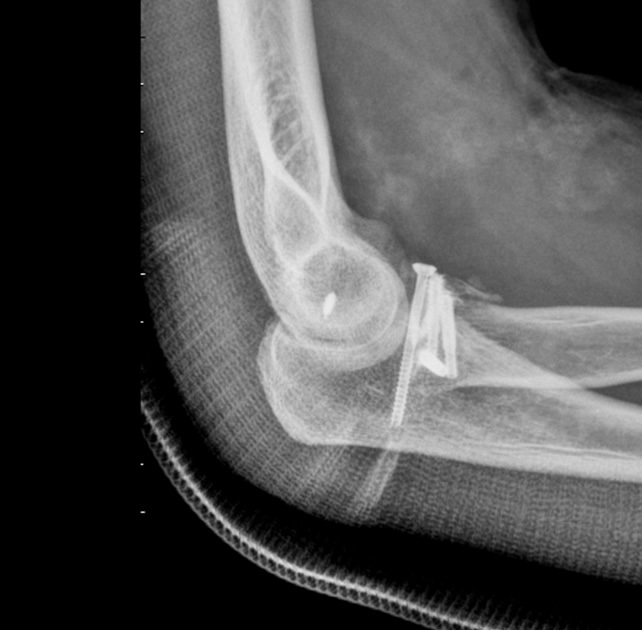 (Figure - 2: Relocated Elbow.) 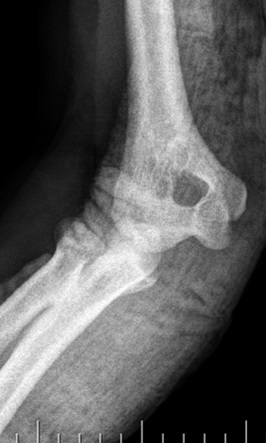 After relocating the dislocated joint, an MR or BT scan may be needed to see if there are injuries in the ligaments or bones that accompany the fracture. After these examinations, the doctor’s decision is important in terms of determining the treatment. Physical therapy is necessary after the treatment. After passing through the groove on the back of the elbow, the ulnar nerve goes on the inside of your forearm by traveling through a tunnel of tissue called the ‘cubital tunnel’. When the elbow is bent, the size of this tunnel shrinks and its tendency to get jammed increases. Since the nerve is rather close to the skin here, bumping it causes an electric shock-like feeling. Repetitive or prolonged activities that require the elbow to be bent for long periods of time such as using the computer, driving, writing, putting the hand under head while sleeping, lead to nerve entrapment in the tunnel. In addition to these, preexisting elbow fractures, and cysts developed near the elbow can also lead to nerve entrapment. As the nerve is compressed, the capability of the nerve fibers to carry messages between your brain and muscles decreases and complaints arise. At the beginning, the symptoms are generally insidious. It is frequently encountered among the population between the ages of 30 to 60 and men are affected up to three times more than women. It can be seen on both elbows even though this is rare. Numbness in ring (4th finger) and pinky finger (5th finger), and a tingling sensation are the most frequent symptoms. (Image 2) Feeling pain is rare. Symptoms can worsen when using the elbow bent for long periods of time such as talking on the phone or sleeping. There can be a slight burning sensation on the elbow and the forearm medial. As the nerve stays entrapped for longer periods, the muscles of the small finger start to weaken. Pinching may get harder. The symptoms are identified by a physical examination and then an electromyography (EMG) is performed while the elbow is bent in order to detect the slowing down of the transmission of nerve signals from elbow level down. For patients who have been diagnosed early, the goal is to explain them the positions which cause complaints in order to ensure that they are avoided. Sometimes, braces that stabilize the elbow can be used to ease the symptoms. Patients with late diagnosis and progressed symptoms (like muscle weakness) need surgery. During surgery the arm is anaesthetized with a fine needle injected into the armpit. The ulnar nerve that has been jammed is moved to another area where it has less risk of encountering the same problem. It may take from a couple of weeks to a month for the complaints to disappear. On occasion physiotherapy is necessary after the surgery. It is a type of elbow dislocation seen only in childhood. It generally occurs when arm is pulled while the elbow is fully extended. The elbow is a special type of joint which is located between one humerus and two radius bones. The joint between the Humerus and Radius is the part that enables the hand to pivot. 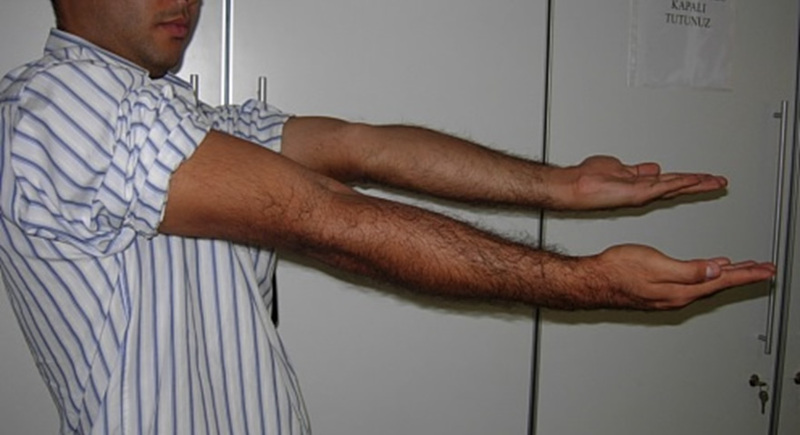 The articular surface of the radius where it connects to the elbow resembles a shaft and this structure must be immobilized by a ligament, called annular ligament, during movements. 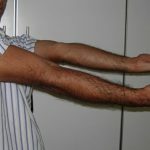 Since this joint has not fully developed during childhood, when the arm is pulled on the long axis, the ligament frees itself from the joint head easily and cannot prevent the elbow from dislocating. It is very painful and patients should generally try to hold elbow joint stable with the hand facing upwards. Especially placing palm upwards intensely increases the pain. The elbow joint is swollen and sensitive. When the history of the injury is inquired, sudden pain experienced after pulling the arm and loss of motion play significant roles in the diagnosis. It is recommended that an x-ray is taken before intervening in order not to miss any possible fractures in the elbow area. After the diagnosis, the doctor relocates the dislocated elbow with a special maneuver. This does not require anesthesia. When the radius head is relocated, the child relaxes and is able to resume using the elbow normally in a short span of time. The important point for parents is that they should be aware of this elbow dislocation which is quite common in childhood and understand that children should never be picked up by pulling from the arm until they are 6-7 years old. This injury does not leave a permanent disability if the elbow is treated well. In adults, the elbow is the second most dislocated joint after the shoulder. A dislocation is defined as the loss of the anatomic relation between the bone surfaces that make up the joint. In simple dislocations, even though the soft tissue around the joint is damaged, there are no fractured bones, and when they are relocated, the patient relaxes and there is no tendency to recurrent dislocation. There are multiple dislocations that occur when there is a fracture on the joints’ articular surface. These injuries are also called complex dislocations and are more challenging and harder to treat. In this kind of dislocations, the joint cannot remain stable because the bones that hold the joint secure have been damaged and therefore it tends to dislocate recurrently. The most commonly encountered form of unstable dislocations in the elbow area is named the ‘terrible triad’. The word "terrible" here indicates the difficulty of the treatment and "triad" signals the fractures that accompany the dislocation in the two bony structures (radius head and coronoid bulge) which provide the stability of the joint. Terrible Triad is a kind of injury that can be successfully treated at the present time and, contrary to its old notoriety, it is not debilitating when treated well. The most important point here is the early diagnosis of the injury and the right surgical intervention. These fractures involve small fragments of bone and can easily go unnoticed when the patients’ x-rays are not evaluated cautiously. The success rate drops drastically in patients who do not receive the right treatment in the early stages. Surgery is generally the most effective treatment of the terrible triad elbow injury; the goal is to relocate the fractured bone structures that provide stability to the elbow joint and stabilize them with screws. Especially in cases where the radius head is too fractured to be reconstructed, it may be necessary to restructure it using metal prostheses. Since the elbow is joint prone to tightness and loss of motion, patients should certainly proceed with a well-structured physiotherapy program after surgery. Otherwise, motion restriction in the patients’ joint is inevitable. The restricted elbow range of motion will certainly inhibit hand movements to the mouth, face, and body, thus limiting the patient in daily life. This will inevitably affect patients' living conditions adversely.